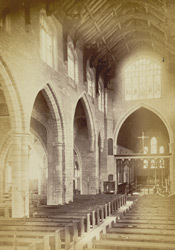 Interior view of the parish church of Saint Mary and Saint Nicholas in Spalding, Lincolnshire. "Entering the Church by the south door...we advance to the nave where, standing at the west end, we can survey the vast and lofty space, with two broad aisles, and numerous arcades, of which those on each side of the nave are the most lofty. From this spot the whole extent of the Church and Chancel is displayed: a spacious nave of seven arches on each side, its roof is of moulded oak framed together, the hammer beam ends being richly ornamented...At the east end of the nave above the lofty chancel arch is a five-light window...recently (A.D. 1867) filled most artistically with stained glass in memory of the late Prebendary William Moore, D.D... Throughout the Church the pillars are four clustered with moulded caps and bases."